Sir Alexander John Ball 1757-1809, rear-admiral, of an old Gloucestershire family, and not improbably a lineal or collateral descendant of Andrew Ball, the friend and companion of blacke, after serving for some time in the Egmont with Captain John Elphinstone, was on 7 Aug. 1778 promoted to the Atalanta sloop as lieutenant, and served in her on the North American and Newfoundland stations till May 1780. On 17 Aug. 1780 he joined the Santa Monica, a frigate lately captured from the Spaniards, and went in her to the West Indies, where in April 1781 he had the good fortune to be moved into the Sandwich, Sir George Rodney's flag-ship, and followed the admiral to the Gibraltar, for a passage to England. There he was appointed to Sir George's new flag-ship, Formidable, on 6 Dec. 1781, went out with him again to the West Indies, and served with him in his great victory of 12 Apri11782. Two days afterwards he received his commander's commission and was appointed to the Germain, in which he continued on the same station until posted on 20 March 1783. Very shortly after his return to England he, like many other naval officers, went over to France on a year's leave, partly for economy whilst on half-pay, partly with a view to learning the language. Nelson, then a young captain, was one of those who did the same, and was at St. Omer whilst Ball was there. He wrote to Captain Locker on 2 Nov. 1783: 'Two noble captains are here - Ball and Shepard: they wear fine epaulettes, for which I think them great coxcombs. They have not visited me, and I shall not, be assured, court their acquaintance.' Epaulettes were not worn in our navy till 1795, but in France they marked the rank, and possibly enough were found to serve in lieu of letters of introduction. On 4 Nov. 1784 Ball, writing from Gloucester, reported himself as having returned from foreign leave. He continued, however, on half-pay, notwithstanding his repeated applications to the admiralty, till July 1790, when, on the occasion of the Spanish armament, he was appointed to the Nemesis (28), a frigate which he commanded on the home station for the next three years. He was then appointed to the Cleopatra (32), and continued for the three following years on the Newfoundland station under Vice-admiral Sir Richard King and Rear-admiral Murray. He was then transferred to the Argonaut (64), and returned to England in August 1796. On his arrival he was appointed to the Alexander (74), and spent the following winter off Brest, under the command of Vice-admiral Colpoys. Some little time afterwards he was ordered out to join Lord St. Vincent off Cadiz, and in the beginning of May 1798 was sent into the Mediterranean under the orders of Sir Horatio Nelson. When he went on board the Vanguard to pay his respects, Nelson, perhaps remembering his pique of fifteen years before, said, 'What, are you come to have your bones broken?' Ball answered that he had no wish to have his bones broken, unless his duty to his king and country required it, and then they should not be spared. The Vanguard, with the Orion and Alexander, sailed from Gibraltar on 9 May, and on the 21st, off Cape Sicie, was dismasted in a violent gale of wind. Her case was almost desperate, and after she was taken in tow by the Alexander the danger seemed so great that the admiral hailed Captain Ball to cast her off. Ball, however, persevered, and towed the ship safely to St. Pietro of Sardinia. Sir Horatio lost no time in going on board the Alexander to express his gratitude, and, cordially embracing Captain Ball, exclaimed 'A friend in need is a friend indeed!' (Nelson's Despatches, iii. 21n). It was the beginning of a close and lifelong friendship, which took the place of the former jealousy; and Nelson, being reinforced bya considerable squadron, proceeded to look for the French fleet, which he found and destroyed in the Battle of the Nile on 1 Aug. The Alexander and Swiftsure had been detached in the morning to look into Alexandria, and did not get into the action till two hours after its commencement, when they found themselves directly opposed to the French flag-ship I'Orient, which blew up about ten o'clock. The fire has been supposed to have been kindled by some combustible missiles of the nature of fire-balls, which the I'Orient and all the French ships had on board, and it was probably from misunderstanding Captain Ball's description of this that Coleridge framed the extraordinary story of the ship having been set on fire by some inflammable composition which Ball had invented, and which was thrown on board from the Alexander. In this there is certainly not one word of truth; for at that time the whole feeling of the English navy was intensely opposed to all such devices. 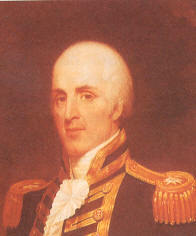 On 4 Oct. 1798 Ball was ordered to go to Malta and institute a close blockade of the island. The blockade then begun was continued without intermission for the next two years, when the French garrison, having suffered the direst extremities of famine, was compelled to capitulate. The force employed in the siege was exceedingly small. On shore there were not more than 500 marines, English and Portuguese, and some 1 ,500 of the Maltese, who hated the French and were devoted to Ball. Ball, on his part, devoted himself to their interests. He left the Alexander in charge of her first lieutenant, and personally took command of the militia. The garrison was reduced entirely by famine, which pressed almost as severely on the islanders as on the French. They might indeed have starved with the French, had not Ball on his own responsibility sent the Alexander to Girgenti and seized a number of ships which were laden with corn and lying there, with stringent orders from the Neapolitan court not to move. After the reduction of Malta, Ball was for some time commissioner of the navy at Gibraltar, at which place Nelson wrote to him from the Baltic on 4 June 1801: 'My dear, invaluable friend, ...believe me, my heart entertains the very warmest affection for you, and it has been no fault of mine, and not a little mortification, that you have not the red ribbon and other rewards that would have kept you afloat; but as I trust the war is at an end, you must take your flag when it comes to you, for who is to command our fleets in a future war? ...I pity the poor Maltese; they have sustained an irreparable loss in your friendly counsel and an able director in their public concerns; you were truly their father, and, I agree with you, they may not like stepfathers. ... Believe me at all times and places, for ever your sincere, affectionate, and faithful friend.' Ball's services were, however, soon after rewarded, not, indeed, with a red ribbon, but with a baronetcy, and he was appointed governor of Malta, where he spent the remainder of his life, and where, after his death, which took place on 20 Oct. 1809, his remains were interred. Notwithstanding Nelson's wishes and often expressed advice, he virtually retired from the naval service, and though in course of seniority he became rear-admiral in 1805, he never hoisted his flag. His affectionate care of the Maltese was considered by many of the English settlers and place-seekers impolitic and unjust, but he maintained throughout that we had won the island largely by the aid of the Maltese, and that we held it by their free-will, as fellow-subjects and fellow-citizens. By the Maltese he was adored. When he appeared in public the passengers in the streets stood uncovered till he had passed; the clamours of the market-place were hushed at his entrance and then exchanged for shouts of joy and welcome. With Nelson he maintained to the last a familiar and most affectionate correspondence, the expressions of which on Nelson's part are frequently almost feminine in their warmth. Nelson habitually wrote as he felt at the moment, and for good or evil his language dealt largely in superlatives; but through the many letters which during the last seven years of his life he wrote to Sir Alexander Ball, there is not a trace of any feeling but the strongest affection. On Sir Alexander's death the title descended to his son, William Keith Ball, but is now extinct. An admirable portrait of Ball by H. W. Pickersgill, R.A., is in the Painted Hall at Greenwich, to which it was presented in 1839 by Sir W. K. Ball. n.b. Coleridge's Friend-'The Third Landing Place' is an apotheosis (i.e. glorified ideal) of Ball, in which the truth is so overlaid by the products of imagination or misunderstanding and by palpable absurdities, that its biographical value is extremely slight.